Note the comments from the Mayor, regarding the effect of the existing wind power project on the community of Brinston. And for WHAT? More intermittent power Ontario doesn’t need? MORRISBURG – A green energy company will likely still go ahead with a proposed wind farm but it won’t be getting South Dundas council support. Company reps from Spain-based EDP Renewables lobbied one last time Tuesday night for the council support resolution for the South Branch Wind Farm II project. After distributing 1,100 letters to area property owners, spokesman Ken Little said they had four written comments following their Aug. 5 open house, one of which was critical of the project. “This is one of the most positive meetings…when you talk about 1,100 mailers distilled down to one negative comment that really speaks a lot,” EDP spokesman Thomas LoTurco added. There was also a cautionary note from Little about the financial benefits for the township. “A municipal council support resolution…is a chance for South Dundas to lock in the benefits of this project at an early stage. Without the municipal support resolution…we cannot make the same financial commitments to the township that we offered here,” he said. But, in a 3-1 vote, councillors decided Tuesday night against sending a so-called council support resolution to the Independent Electricity System Operator on behalf of EDP Renewables. The lone supporter was Deputy Mayor Jim Locke, who read a prepared statement. “It’s particularly hard for me as I presented the motion (in 2013) that South Dundas not support any future green energy projects until there was a demonstrated need. By the way, that motion did not say we were ‘unwilling host.’ That handle was added by others,” Locke stated. “A lot has changed since that time. Green energy is not a fad and is here to stay and will be growing,” the deputy mayor added, in pointing to IESO data showing a gap in electricity needs when nuclear plants are taken offline in 2018-2019 for refurbishment. “In my opinion, a wind contract at eight or nine cents per kilowatt hour will not cause an increase in hydro rates,” Locke said, in referring to the open house where he said the main concern he heard was skyrocketing hydro bills. “If we do not support this project and it wants to go ahead anyway we lose $6.5 million dollars right off the bat and I’m not willing to take that gamble,” Locke said. Coun. Archie Mellan declared a conflict of interest and was not part of the debate nor the vote. Coun. Bill Ewing suggested the municipal benefit fund proposal of $6.5 million over 25 years not being on the table without a support resolution was akin to ransom or blackmail. Coun. Marc St. Pierre couldn’t get past the uncertainly of the future, outlining concerns about what would happen with the windmills if the province abandons its green energy plan. “I’m not disputing any of the results from the public meeting…I think some people were reluctant to voice their opinion at that meeting and I’ve had several calls since as well as several emails,” Mayor Evonne Delegarde. “I think the existing project…did divide the community and it put strain on a lot of relationships with friends and families and neighbours and I think a further two to three dozen (wind turbines) to the east or to the west…this will put a further strain on those relationships,” the mayor said. “We’ve taken a lot of pride in the agricultural sector and I think that’s changed the agricultural landscape and it’s going to be a lot more than what we see now,” Delegarde said in closing. The resolution would have helped EDP get preferential scoring in its bid to build a 75 megawatt wind farm east of the existing South Branch Wind Farm near Brinston. The project would be roughly 20-30 turbines spread over 10,000 acres – roughly three times the size in area of the South Branch Wind Farm. Council for the municipality of Nation, just east of Ottawa, met last evening and decided to reverse a motion of support for two wind power projects, in St Bernardin and St Isidore. Nation is now Not A Willing Host to wind power projects, making it the 90th community in Ontario to reject wind power proposals. The community group Save The Nation/Sauvon La Nation held a huge public meeting last week, and revealed that council had passed the support motion with no public discussion or input. The majority of residents are opposed to the power projects on the grounds that the potential for environmental damage is significant, and the impact on agriculture and the social fabric of the communities would be extensive. “We are not for sale,” said Julie Leroux of Save The Nation in an interview. EDF of France had claimed it has spent hundreds of thousands wooing the community, paying for hockey dinners and other events designed to sway farm owners to sign leases for the project. See the story from CTV News here: http://ottawa.ctvnews.ca/residents-of-nation-east-of-ottawa-fight-wind-turbine-projects-1.2510730 Related story: the town of Essex last night voted not to support a new wind power project, saying they want no more wind turbines. There are now 91 Not A Willing Host communities in Ontario. Is Big Wind going to win out over community concerns? Can communities say no to wind turbine installation? The answer, my friend, may be blowing in the wind. The Township of North Stormont will hold a council session on Tuesday where they will be receiving a report from chief administrative officer Marc Chenier and community planner Amy Doyle on proposed renewable energy projects in the region. EDF proposed a substation to funnel energy from a project in The Nation Municipality and have secured a lease with a landowner south of County Road 9. Leader Resources is planning a 61 MW wind turbine operation on the east side of the township, around Crysler and Berwick. According to their proposal they will build no more than 21 turbines. EDP is looking to build turbines on the west side of the township, proposing a 100 MW operation of 29-50 turbines. EDP will host a community meeting on Aug. 6 at the Finch Community Arena to meet with the public and discuss the large renewable procurement (LRP) process. Council will have to decide whether or not to support the projects, however, they will have little say over whether or not the projects go through. As noted in the report, townships can declare themselves unwilling hosts, while this has been perceived as opting out of having projects take place in the region, this is not how the application process works. Ontario’s Green Energy Act allows all decisions regarding the placement of renewable energy projects to be carried out at the provincial level of government. According to the report, municipalities have little to no say in whether or not they will have renewable energy projects in their region. “Almost all of those who declared themselves as an unwilling host still received a renewable energy project (i.e. wind turbines),” the report reads. The projects have received backlash from the community. 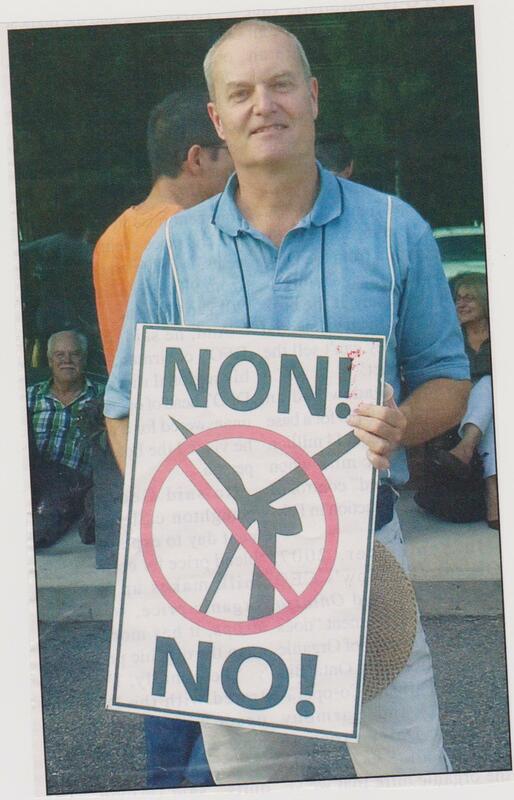 When Crysler local Todd Brazeau got the notice about companies looking to put wind turbines in, he contacted his municipal council and MPP to protest. “It seems like the community doesn’t have a say and the politicians aren’t being honest at all,” Brazeau said. According to McDonell, the petition already has hundreds of signatures. EDP Renewables has taken the brunt of the negative response from the community. Leaflets distributed with McDonell’s petition in May made specific mention of the plan to put in 29-50 turbines. EDP declined to answer questions regarding public response to their proposal. North Stormont mayor Dennis Fife said that almost all of the township’s council are opposed to the installation of wind turbines, but noted declaring as an unwilling host will do nothing to stop the project, only cut down on the cents per kilawatt incentive for the renewable energy companies.